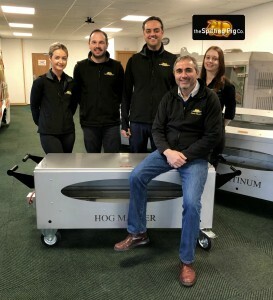 As the manufacture of a large range of hogroast machines and the proprietor of the largest hog roast catering franchise in the UK, we can offer you the perfect environment to learn about which hog machine to purchase and train you with the ins outs of running a hog roast catering business. See all available Hog Roast Machines new and used in one location at our indoor showrooms. We operate a nationwide catering franchise cooking hundreds of pigs throughout the UK every week. This means we are constantly using and developing our equipment every day ourselves. Become a Spitting Pig Approved supplier and receive Work from Spitting Pig. READ MORE. 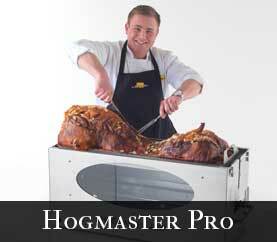 Looking for a hog roast machine for hire or sale? Your search stops here at The Spitting Pig – the worlds leading hog roast machine manufacturer! We manufacture and develop hog roast and spit roast machines at our state of the art facility in Lancashire. Not only are we the worlds leading manufacturer we are also the biggest user of our own equipment through the Spitting Pig hog roast catering franchise. What this means is we are using our own equipment every day 365 days a year throughout the UK. Continually testing and developing our existing range and new ideas. 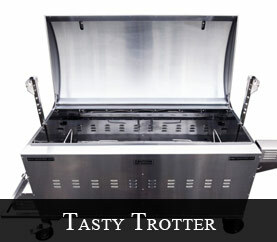 We brought out the original hog roast conversions, bbq attachments, serve over counter etc. We lead whilst others follow. So if you want the best possible equipment at the best possible prices come direct to the manufacturers. 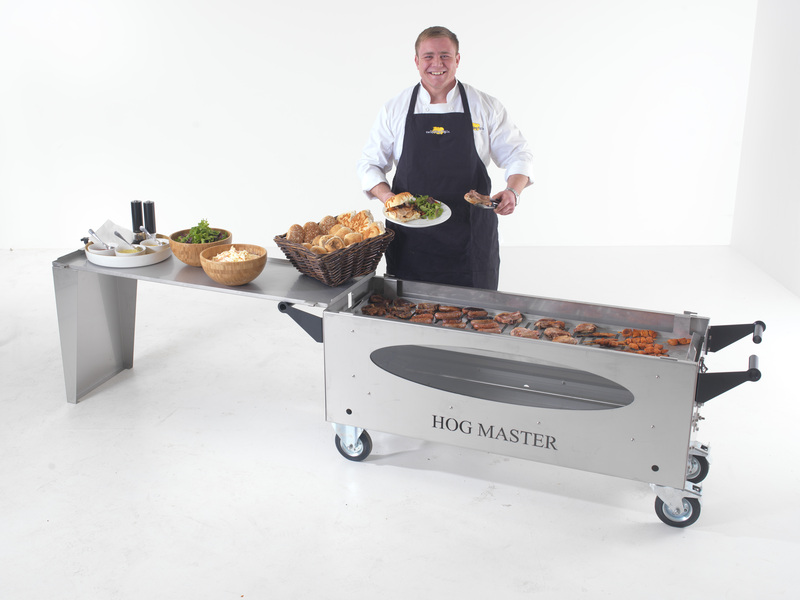 Visit our show room and see all available hog roast machines in one great location. Hi my name is Stephen Marsden and I am the owner of Spitting Pig. 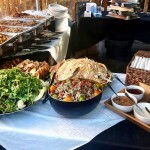 Like many of you I started out as a hog roast caterer, from a small beginning in 1988 I quickly grew my business to cover the whole of the UK including Ireland and a few trips each year into Europe following events such as Formula One Racing. I always made my own hog roast machines and whist out working people would ask me could I make one for them. This quickly developed into a new side line for my catering business. Eventually becoming as big as the catering business and incorporating a training facility. In 2007 I then made the decision to franchise the catering business so that I could concentrate on the manufacture and training. Starting off with the Thor and Titan models, we opened our factory in 2005 enabling us to do much more research and development, what quickly followed was the Hogmaster and Platinum range and we have never looked back. 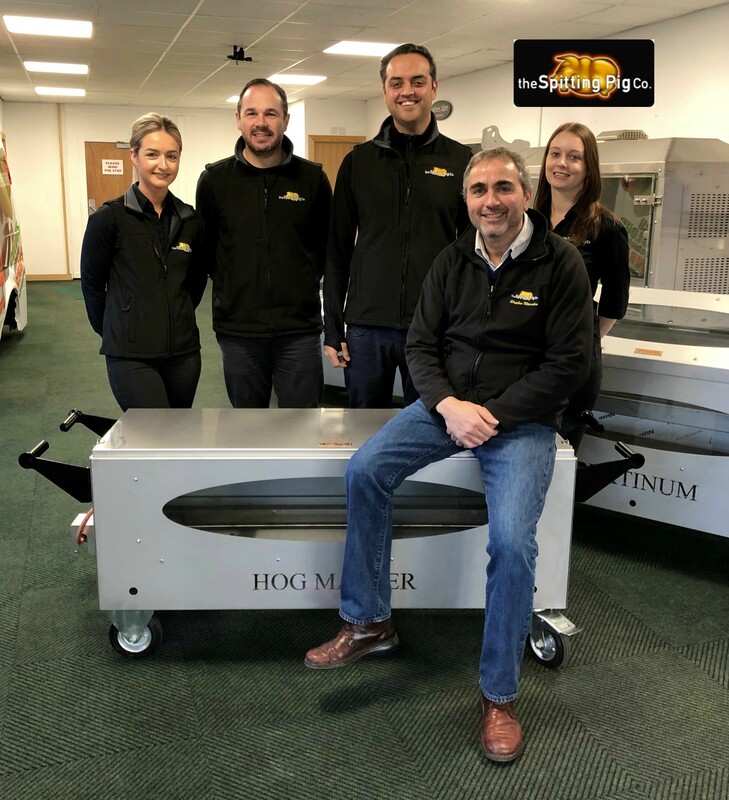 We then developed the Olympian which can be used indoors or outdoors and more recently the Hogmaster Pro range for small business and home use. What you get when you buy a hog roast machine from Spitting Pig is our 30 years of experience running a hog roast catering business. This means I understand completely the challenges you will face each day you are out catering. 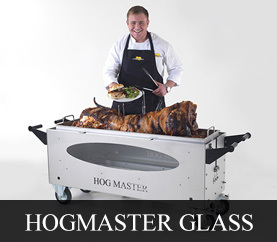 This has enabled us to build a whole range of hog roast machines each one having specific strong points. Once you contact us we will chat with you about your business ideas and this will enable us to help you chose the correct machine or machines for you. 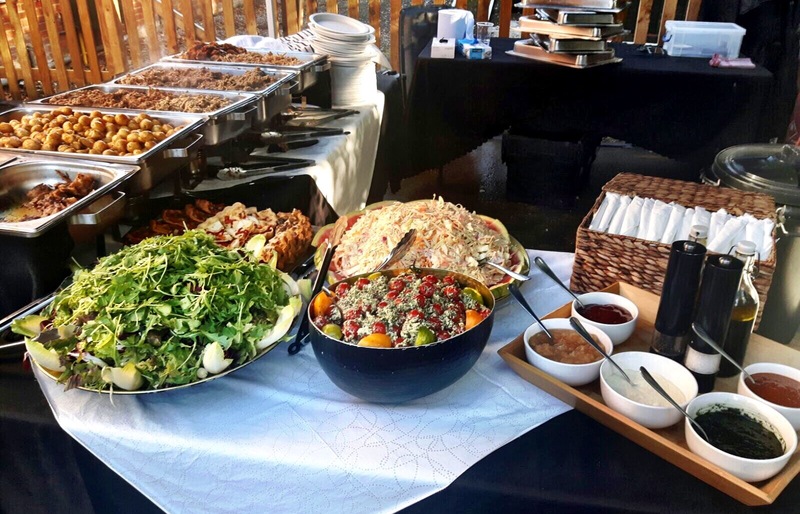 We can then help with general guidance for cooking and serving and if needed advice on running a hog roast catering company. We also offer training days where you get to spend the whole day with the Spitting Pig team at our head office where we will cook a pig with you and all the accompaniments including salad and veg. 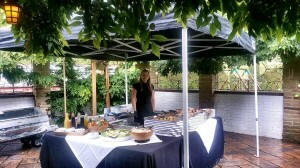 We will then invite people round for lunch so you can then get experience at serving at a real live event. 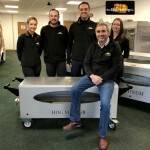 At our factory in Lancashire we actually do manufacture our hog roast equipment, unlike others we are not having them built abroad cheaply or simply taking photos of someone else’s facility with our equipment temporarily in position. Feel free to visit whenever you are passing there is no need to make an appointment. Everybody who visits the factory are always glad they did as you get to see a large range of different machines in the same place at the same time and you can check out all the different attributes of all the machines. You can see our team making the machines and get the confidence of knowing how well built they are and see our great stock holding levels of machines and spare parts all available for next day delivery. 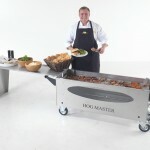 For the perfect Hog roast barbeque event the hog roast machine we offer includes four main types of hog roast machine ranges including Hogmaster – the budget range, Titan range, Platinum super versatile will cook 2 pigs at the same time, the Hogmaster Pro for the home user and the Olympian which can be used indoors or outdoors. 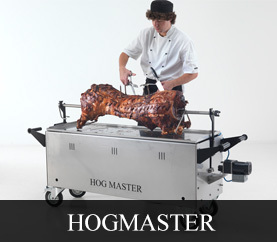 Whichever you choose to buy or for hog roast machine hire, you will not be disappointed. The Spitting Pigs’ knowledge of cooking meats is unrivalled and this is reflected in the design, engineering and manufacturing capabilities of the hog roast machines for sale that we supply. It would also be good to note that all of our hog roast hire machines comply fully with all of the latest food regulations. 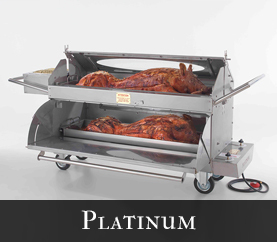 With the Spitting Pig you can rest assured that you have made the right decision for when choosing your hog roast machine. 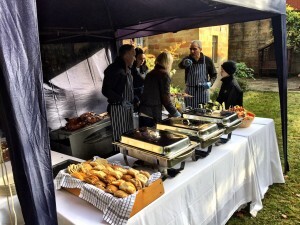 From our customer service, to our costings, service and simply the experience that we’ve had in the business, We are your first choice for hog roast hire. Get in touch today or browse throughout full ranges on the website. We realize that buying a hog roast machine is a big investment to many. We want to walk you through exactly what you will need, answer any questions, and give you as much knowledge as possible about every machine. Our goal is to make sure that you have a machine that meets your needs, and that you feel good about your decision. Your hog roasting machine will give you enjoyment for years to come. It really is a wise investment. People save very large amounts of money choosing a pig roast over preparing traditional dinners. It also saves you quite a bit of stress during your lifetime from slaving over the stove. 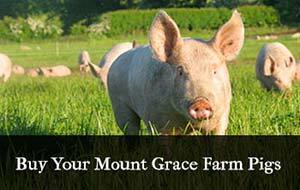 We have years of experience in the hog roasting business. The hog roast machine for sale is very important. We promise you nothing but CE approved hog roasting machines. Our machines are hand built using the finest material and latest technology. You will feel confident when you own one of our many roasting machines. You will get a quality guarantee as well as professional and prompt maintenance service. If you have been looking for a way to surprise the cook in your family, why not consider obtaining a hog roast machine for them? These machines can either be hired directly through us, or purchased if you deem necessary. Most people however, are curious to see how well our machines operate, they will hire a machine first and if they are pleased with the machines performance, they will later render payment for the machine. There are many different things that make a hog roast machine a great investment. Typically, these machines are used to cater large events, however you can choose to use your hog roasting machine whenever you deem necessary to do so. The machines allow you the opportunity to be able to cook large portions of food without having to slave in front of a stove or grill all day. Hog roast machines are extremely versatile, just because their name starts with the word hog, this does not limit the different foods that you can enjoy cooking on the machine. These hog roast machines have the ability to perfectly roast pigs, chickens, turkeys, deer and literally any medium sized animal that you desire. Aside from the main task of animal roasting, this machine also has the ability to roast vegetables as well. When you choose to hire or buy one of our hog roasting machines, you will be equipped with all of the necessary equipment that you will need in order to cook an entire meal. The exterior of the hog roast machine consists of stainless steel, which allows the internal heat to remain locked inside of the machine to allow the machine to perfectly roast all of your desired meal choices to utmost perfection. Hog roast machines are by far, not a new invention. There are actually a lot of speculations that after fire was first created by cavemen; they actually made the first hog roasters. Of course, their roasters were a simple stick that they placed over their fire and had to turn by hand in order to allow the food to cook thoroughly. However, this innovative design paved the way for the hog roast machines of present day. Our machines will engage in turning your meat around in a full circular turn to ensure that your meat cooks to perfection on all sides. 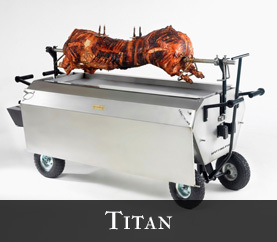 Hog roast machines are a combination of your normal standard grills and a rotisserie. Perhaps, one of the most attractive features about the hog roast machines is that the machines do not require much interaction from the person that is opting to use it. All that an operator has to do is skewer their desired meat that they are opting to cook, set the temperature on the machine and engage on checking on their cooking animal carcass sporadically. Time is a vital component when it comes to using one of these machines, so setting a timer that will ring when the roast is complete will make cooking your hog roast a lot less stressful. Normally, a hog that dresses out around 100 pounds will require at least 6-8 hours to be cooked to perfection.